April is distracted driving awareness month and police officers are extra tuned in this month to put an end to the dangerous diving. In Oregon over the past five years, 95 people died in crashes involving a distracted driver, and more than 18,400 were injured: and these are all preventable crashes. These crashes are caused by people texting, fiddling with their phones, taking their hands off the wheel and taking their mind off the road. & if that wasn’t enough, let me remind you that distracted driving is not only dangerous, but it is expensive. First offense, not contributing to a crash: Class B violation; Fine up to $1,000. Second offense – or first offense if it contributed to a crash: Class A violation; Fine up to $2,000. Third offense in ten years: Class B misdemeanor; Fine up to $2,500; Could face up to six months in jail. 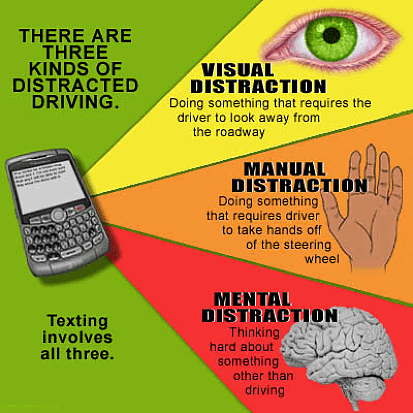 So before you pick up that phone, or answer that text please think twice about driving distracted.